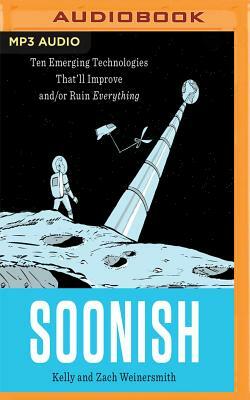 From a top scientist and the creator of the hugely popular web comic Saturday Morning Breakfast Cereal, a hilarious investigation into future technologies - from how to fling a ship into deep space on the cheap to 3-D organ printing. What will the world of tomorrow be like? How does progress happen? And why do we not have a lunar colony already? What is the holdup? New technologies are almost never the work of isolated geniuses with a neat idea. A given future technology may need any number of intermediate technologies to develop first, and many of these critical advances may appear to be irrelevant when they are first discovered. The journey to progress is full of strange detours and blind alleys that tell us so much about the human mind and the march of civilization. To this end, Soonish investigates 10 different emerging fields, from programmable matter to augmented reality, from space elevators to robotic construction, to show us the amazing world we will have, you know, soonish.